I hadn't even heard of Death Becomes Her or You (the former is the exhibition, the latter the event) until I was emailed an invitation to come in period clothing. Since Julie moved far away there haven't really been any events close enough for me to go, and I was so excited! But I have nothing suitable for mourning in the period covered by Death Becomes Her - technically, my white cotton 1780 gown, if worn with a white petticoat, would count as second mourning in its period, though - so I had to take action quickly: I had to make the best use of my time as I'm a slow sewer. 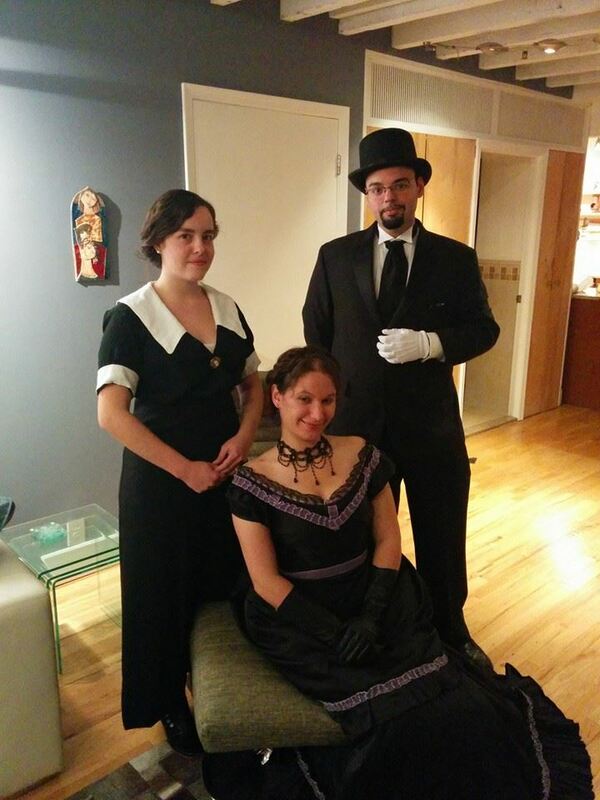 In the end, I went with the early 1910s. My sewing speed was really an issue, especially as I'm working a part time job and cataloguing at a local historical society twice a week! I couldn't spend a lot of time scaling up a complicated pattern, or making a bunch of petticoats to fluff out skirts, or hand-sewing everything (because even for an event happening soon I'm not going to compromise on that). And I have always liked the 1911-1914 silhouette. After some dithering, I went with Butterick B6093, which looks like a reprint of an historical Butterick pattern. 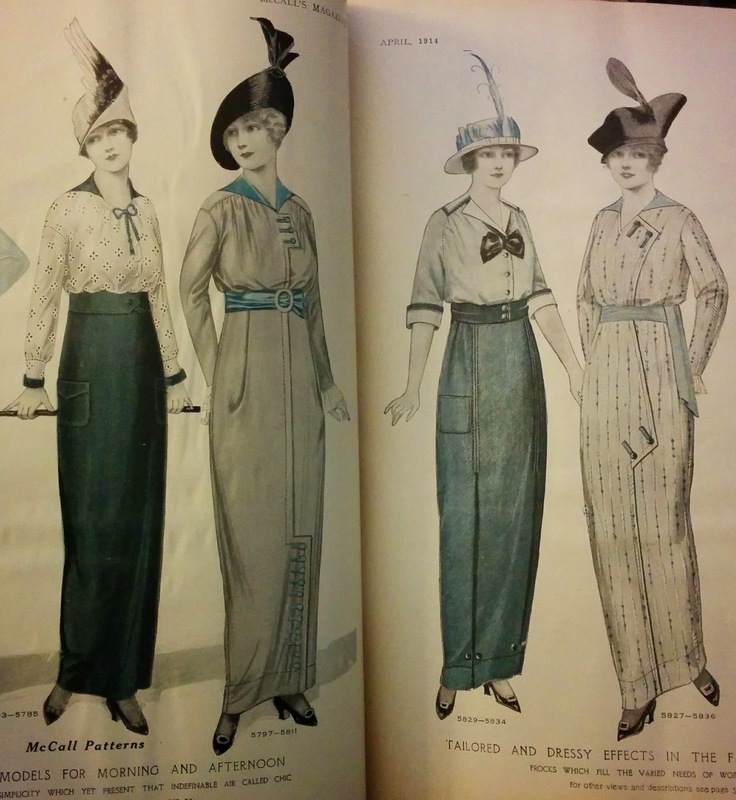 The long-sleeved version is hideous, but the other view looks very much like many dresses in my April 1914 issue of McCall's. My original assumption was that the pattern was an original with updated, modernized instructions, but soon after I ordered the pattern on Etsy I found out that this is not so. They want you to make it all up and put in a zipper in the side! 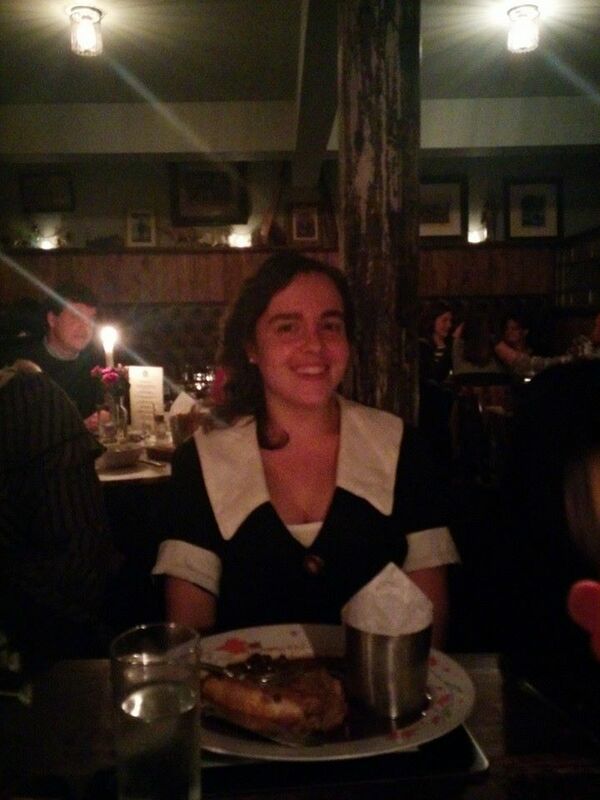 I was almost prepared to scale up and hand-sew an 1840s dress, do you think I would stand for that? No, no. But I have handled so many dresses of this period that it was a cinch to figure out how to make it in a plausible manner while completely ignoring the instructions given. First I cut out the lining in unbleached muslin, shaping it so the edges met at center front instead of overlapping, and fitted it in front and back with darts. Edwardian, post-Edwardian, and early 1920s dresses were mostly made with overlapping layers attached to a fitted lining. In some ways, this makes construction easier: if you know the lining fits, you can gather and tack down and apply anywhere to get the dress to look any way you want it to. I sewed the shoulder seams separately in each layer, but sewed the side seams together through all the layers to anchor the bodice. Resting the bodice on my dress form (which still doesn't match my body, by the way), I gathered up the back by hand to fit, and attached the back of the skirt. After making the whole skirt up, just to be clear. Due to my only having 2.5 yards of 60" wool because of reasons, I had to make some changes to the pattern: no floaty overskirt panels. Instead, I would use the plain underskirt, and fasten it with a dog-leg closure as the crossover front can't extend all the way to the side seam (as I found to my frustration). 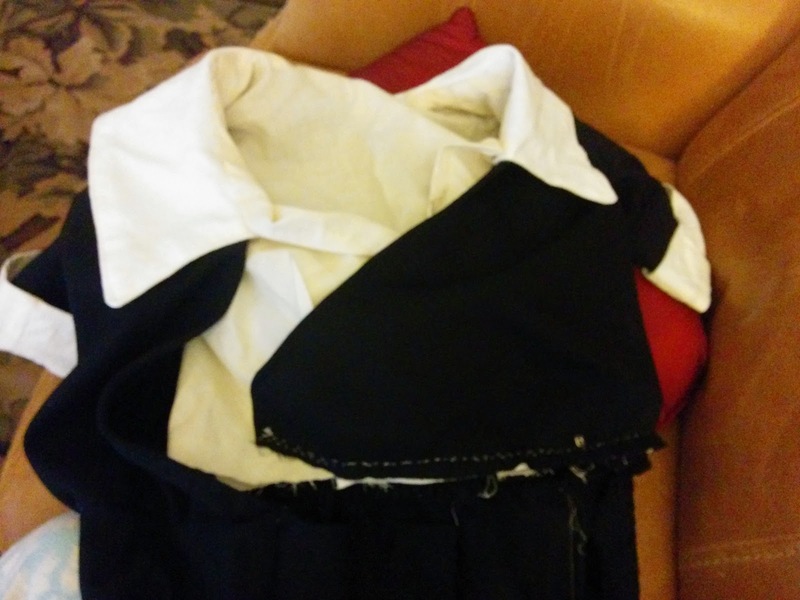 The left side of the bodice is free: I gathered it slightly and sewed it to a white twill tape, putting a snap at the end to fasten it. 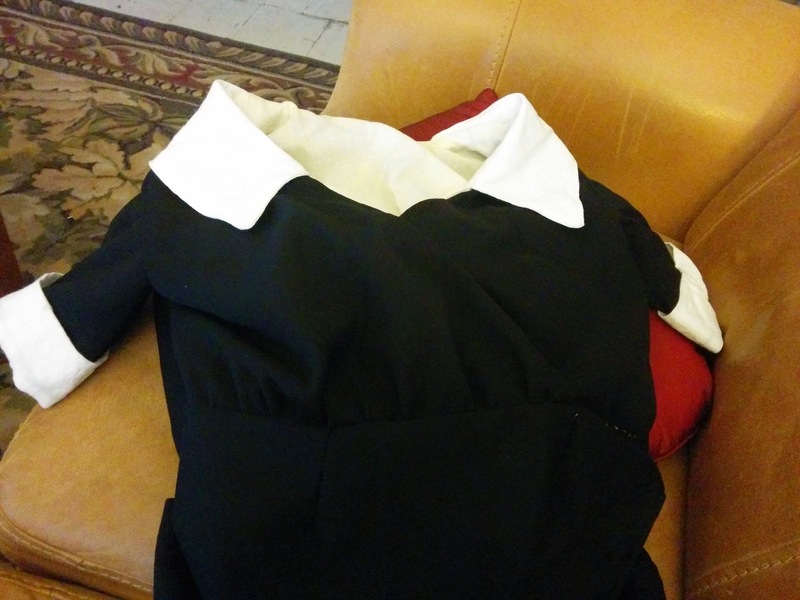 I made up the collar and then sewed it to the wool layer (this is why the shoulder seams have to be done separately in each layer), slipstitching the lining inside. The cuffs were done in reverse, having one side of the cuff sewn to the sleeve, then the other folded down and slipstitched to the inside. I had some problems with the sleeves - the pattern pieces are cut to make quite a puff at the top, which doesn't show in the pattern drawing. My wool is kind of a winter suit-weight, and I didn't want a big puff anyway, so I tried to cut them down, with some success. The crossover had to be pinned in place with a cameo brooch, as it wanted to puff too much. Me with Julie and Dan before leaving for the Met. Hair is tricky for me, as mine is currently just below my shoulders. For this period and the 1920s, I twist side pieces of my hair to fluff out, and usually make a very low bun - due to the length, I had to just roll up the back and try to fasten it, but I ended up redoing it constantly. I bought a trio of black plumes to try to use as ornaments, but in the end I knew I wouldn't be able to manage that. (Look out for black feathers on my Etsy store. Just tell me if you're interested!) So nothing interesting in my hair. My hair never stays up. Overall, I think this is a very good, accurate pattern, provided that you ignore the instructions. It really is basic enough to be altered into some of the variations I gave above. I would love to use it again to make the green-striped dress with the buttons down the crossover and on the skirt. I don't have the number of reenacting shoes I would like. Generally I make do with my Fugawee Annas (for the 18th century and some of the 19th), modern brown flats (for all evening and Regency occasions), and Gibsons (20th century). 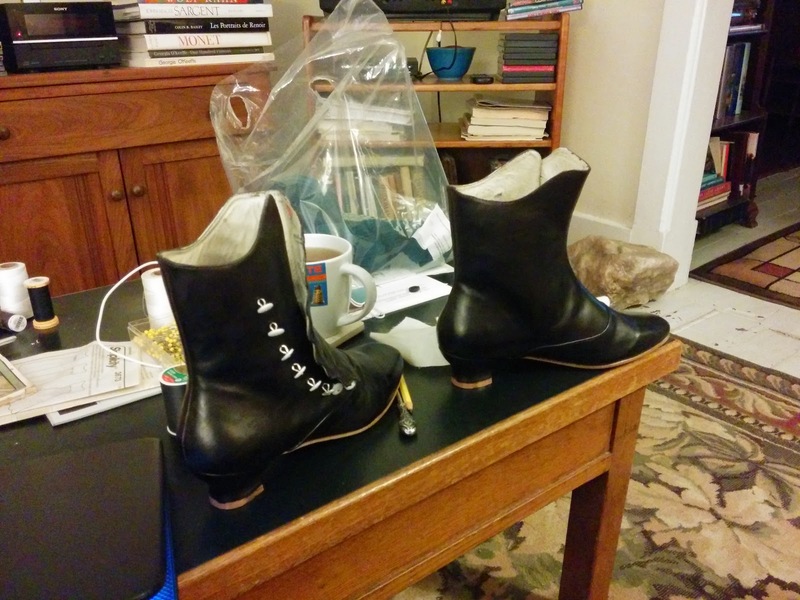 But I am gearing up for an Early Bustle wedding, and it seems appropriate to have proper shoes for a wedding, so I got involved with the Renoir preorder. 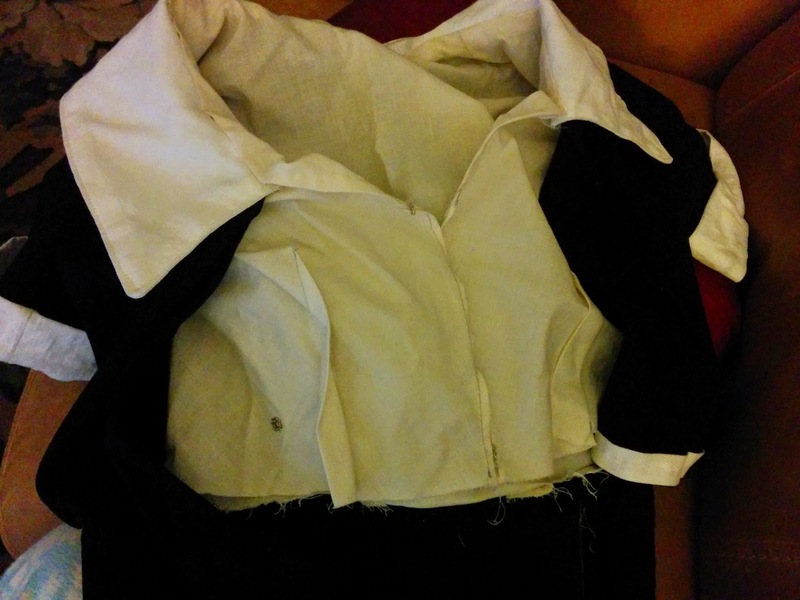 But I needed them to be black, and of course they inherently require alteration with the buttons, so I let them sit around until very recently, when I realized that they would work for this outfit and I should finish them. The dye was more watery than I was expected, and at first I was dribbling it around. It's on the sole! Another thing to beware is that if you dye the area with the original holes for the buttons lying flat, the dye will seep into the lining. Don't let it happen, it will annoy you. Also, polishing requires a lot more buffing than you might expect - I'm still getting some on my fingers. But I feel that the dyed and polished black makes for a deeper, fuller color than a factory dye. I wore these to my volunteer position on the Wednesday before Halloween in order to break them in, and they were very comfortable. Bear in mind, I have flat feet and normally wear insoles and no heels - here, short heels and no insoles. So I decided to wear them down to New York in order to save on packing. The story of my travels within New York is long and stupid; let it suffice to say that I did a lot of extra, unnecessary walking. I'm pretty sure that if I hadn't done all that extra walking at a city speed, I wouldn't have rubbed a tiny spot on my ankle raw - it didn't happen until about 8pm. These are so comfortable! I'm sure that at any event where you aren't constantly forgetting things and having to rush back to get them, these would not cause any problems. The Renoir boots get my wholehearted approval! I can't wait to wear them to another event. Love the Edwardian creation! I fully advocate taking decent patterns and ditching crappy instructions--I do it all the time to aim for better authenticity (even with patterns purportedly created for reenactors!). The whole effect is very nice--even your hair :) which I think looks very period-plausible. I am definitely thinking more about using some commercial patterns as bases and altering them to match the ones I've taken, because that first step of getting to the basic right size is so important and so difficult for me. I've been hesitant but it really does seem like the sensible thing to do! Oh, Swype keyboard and your autocorrect. You look awesome! I thought I spied button boots under your skirt, and I LOVE the way the Renoirs came out in black. They look amazing! Thank you for sharing! Thanks! 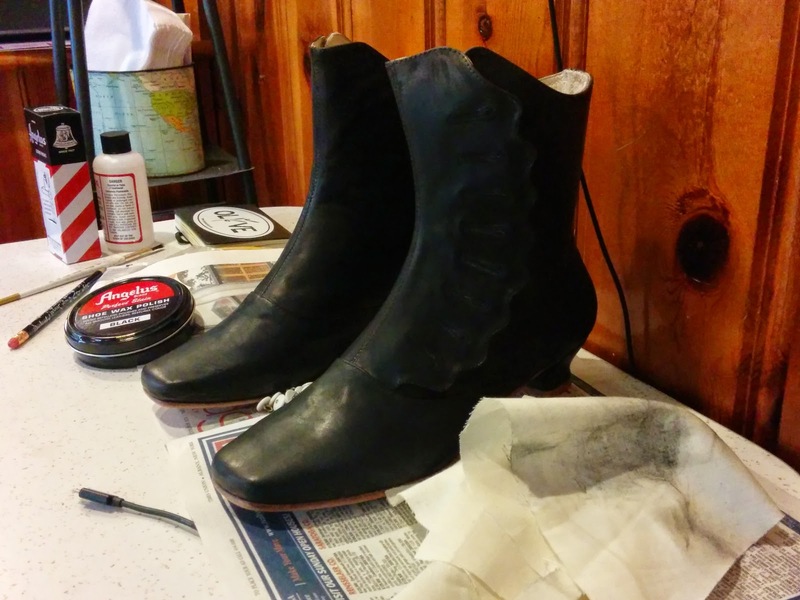 The boots are really amazing, I'm so happy with them, and can't wait to make an outfit that they will be technically accurate under. A big part of me wanted to make them red, but that will not work for the wedding, so I put that on hold until I get another style of shoe. Oh hum... I guess I shouldn't be afraid to do this on my own. I'm sure I still have your email tilling me how to do this. I should have mentioned I was referring to dying the boots black. Don't be afraid! It's a bit daunting at first, but as long as you go slow and have a paintbrush to do the edges, it should come out fine.